The BB-8 Sphero droid made a huge splash when Force Awakens came out. With the film Star Wars: The Last Jedi the company is upping game with a slew of droids. As with the original BB-8 these droids are super cool and are expected to be amonst the top sellers on Force Friday and this Christmas Season. Also like the original they are not cheap and all cost more than a 100 dollars. Want to buy some droids on Force Friday? Here is a run down of the new droids coming from Sphero! The app for Sphero is being updated to work for all of the droids so you can use the same app for all of the droids and the Force Band. 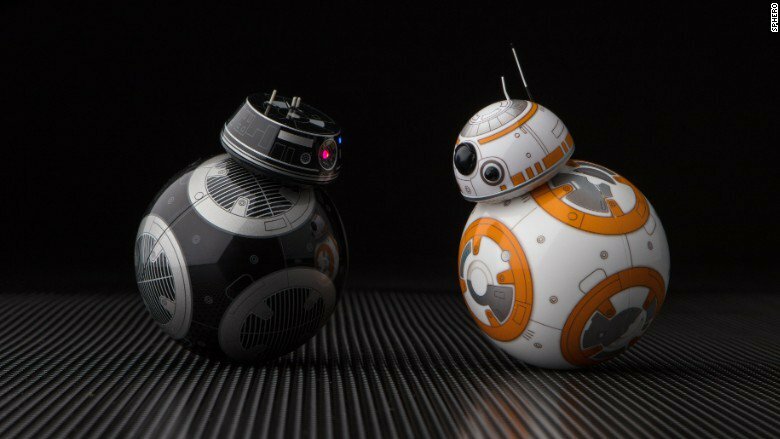 The BB-9E is pretty similar to the BB-8 but one cool thing it can do is that its head has lights that light up. The BB-9E being the evil droid has a red hued interface on the app. The R2D2 has a variety of cool features. It rolls around on the legs of R2D2 and it can also topple over in a similar fashion to how R2D2 dropped when blasted by a Jawa in Star Wars: A New Hope. R2D2 features a head that can spin a full 360 degrees around giving added way of showing emotion. The biggest feature upgrade in R2D2 though is that it is embedded with its own speaker made by Bose. While the sounds for the BB droids come from your phone the R2D2 is able to make these sounds on its own. The droid is also able to make a wide variety of its iconic sounds giving it a great of expression. R2D2 is also about twice as tall as either of the BB droids. Sphero has added an augmented reality game to the app where the interior of a star ship is depicted effectively layered out over the space where you are playing. You can explore the ship with the same commands being sent to the droids on the ground. You will want a sizable area to play this game. One really cool aspect of the app that I want to draw attention to is that it now includes some basic programing commands that make this an entry into the world of coding type of toy. The previous version of BB-8 was not this way. BB-8 just did exactly what you told it to do in real time. This new app features the ability to draw a path on your screen and then the droid will forllow that path. This is a very intuitive and simple way to get kids coding. In a time where all parents are looking for toys than enhance their children's coding skills I see this as a major addition to the toy. There will also be a third way to use the droids and that is by using the Force Band. My understanding of this is that if you are wearing the hand you will be able to transmit signals to the droids by waving your hand around. I don't think I would count this as true coding but it is pretty cool. Sphero Star Wars Toys can be found right on Amazon! Toylab has gone out and found these helpful links to help you find the best deal on Sphero toys.